US wild horse advocates have filed a lawsuit questioning whether the Bureau of Land Management’s (BLM) gathers amount to humane treatment. 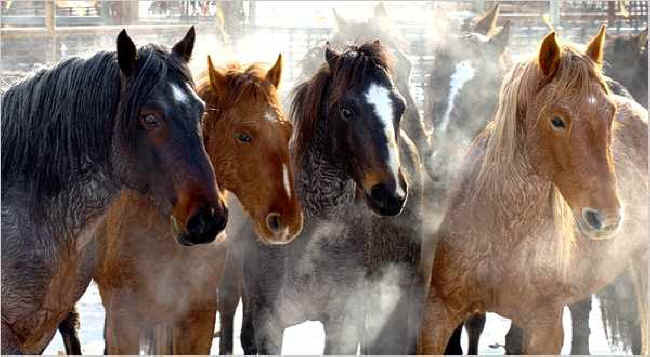 The Wild Horse Freedom Federation (WHFF) filed a lawsuit and an application for a temporary restraining order against the bureau in Federal Court in Reno, Nevada on Wednesday. The federation said that through its plaintiff, Laura Leigh, the issue of humane treatment will have its day in court. The federation alleges that questions of humane treatment, including basic care such as water and feed, often come into question during roundup operations. “Day in, day out, roundup to roundup, I see the same issues,” said Leigh, who is vice-president of the federation. Leigh has witnessed more roundups than any government or public observer in the last 18 months, the federation says. She has spent countless hours documenting wild herd behavior and the process these horses face once they are removed from the range. The definition of humane treatment applied for bureau gathers centers around “handling compatible with animal husbandry practices accepted in the veterinary community, without causing unnecessary stress or suffering to a wild horse or burro”. Inhumane treatment means any intentional or negligent action or failure to act that causes stress, injury, or undue suffering to a wild horse or burro and is not compatible with animal husbandry practices accepted in the veterinary community. “Accountability within the actual activities of the BLM has been an ongoing issue,” federation president R.T. Fitch says. “Actually finding an avenue to address the core intent of legislation has been almost impossible,” he says. The federation is a registered, Texas non-profit corporation with 501c3 status pending.